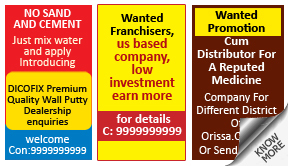 Why place Business Ad in Samaja Newspaper ? Book your ads over the Internet in a simple 3 step process that takes less than 10 minutes in entirety. We do not charge any additional fees for the provision of online booking. In fact, booking online with releaseMyAd means you get the lowest advertising rates in the industry. You will be updated on the status of your ad during the various stages that lead to the processing of the ad. Business ads are printed for a variety of reasons - Someone might wish to lease out an office or workshop, someone might look to enquire for an office or workshop, some advertise to look for salesmen and some look for investors. With India warming up to the concept of startups and independent businesses, this category is gaining momentum and is already numerous ardent followers. How To Book Business Ad in Samaja Newspaper ? From the section above, view the rates and choose the location you wish to advertise in. 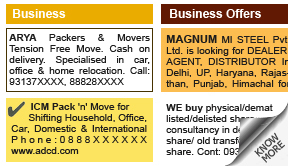 Compose your ad. You can view sample ads before composing your ad. To view them, click on the appropriate tab. Select advertising date(s) and clear your advertising bill via a host of online & offline payment options. Get the Lowest Advertising rates for Samaja Business Ads!